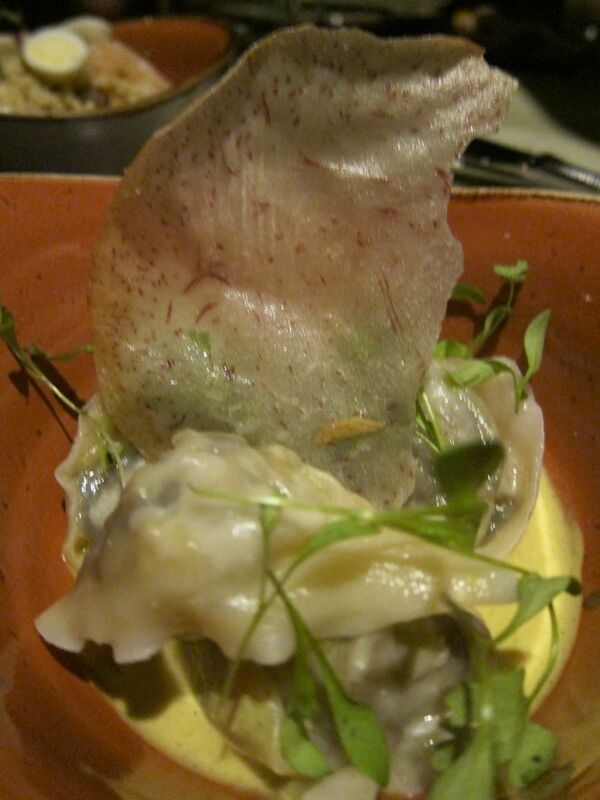 Oxtail dumplings with a taro sail express Asia in this African-Asian-Southern diaspora. To eat New York, as I do six nights a week, is to discover and rediscover the city. Some of my foodie pals focus on what’s new and edgy on the Lower East Side and in Alphabet City. A few can’t see farther than the Meat Market. Others are curious about what’s new in cool hotels. Good-natured friends can be persuaded to adventure as far west as improbable 10th and 11th Avenues. Some home folks won’t go anywhere out of their own zip code. “What’s new on the Upper East Side?” they ask, full of self-pity. We don’t see this urban mix of black and white downtown much anymore. It fills the bar. But just say Harlem and they’re in. 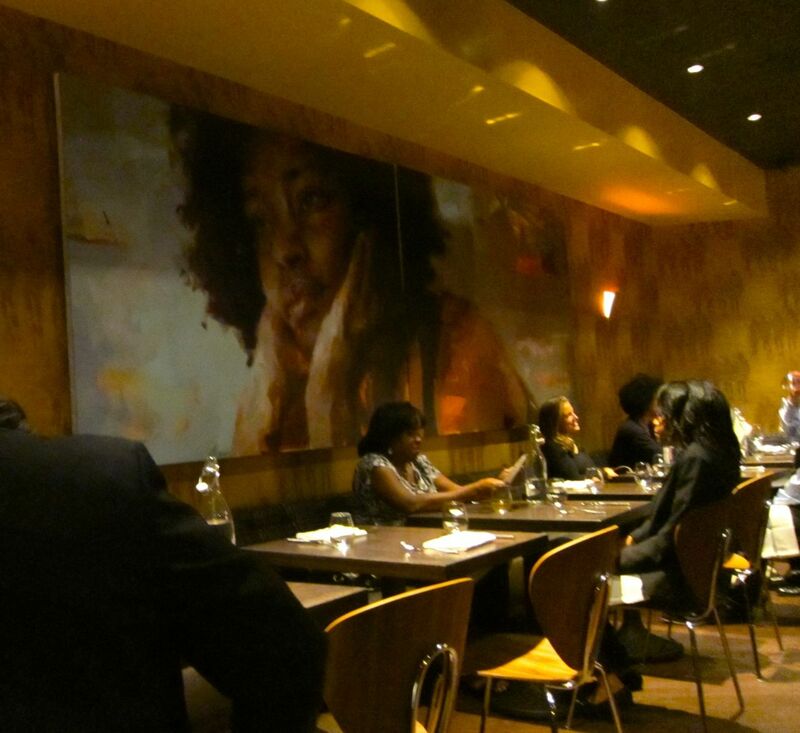 Everyone I’ve taken to The Cecil, the sprawling brasserie of the African diaspora, run by Alexander Smalls for onetime Time Warner top gun Richard Parsons, has loved it. 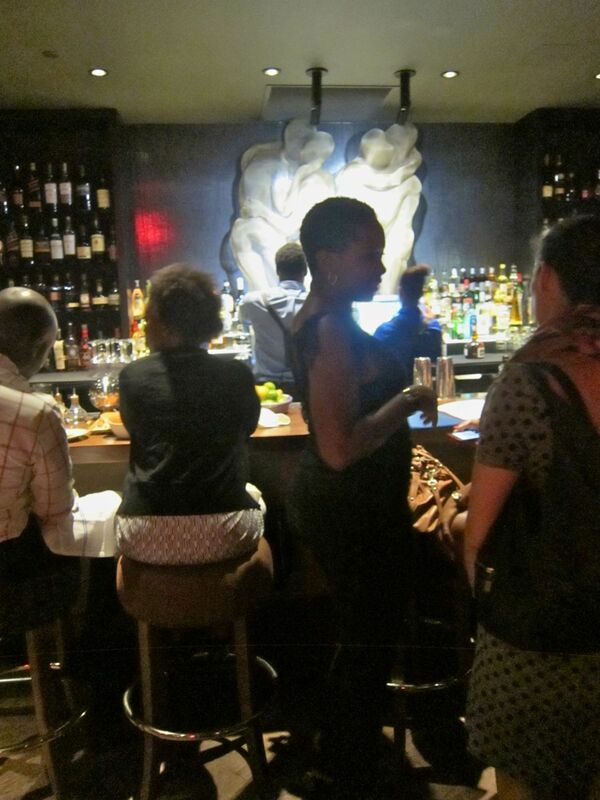 And it’s not just the odd mix of Asian, African and soul, so unlike what’s cooking downtown. Some of the food is remarkably good and the odd cocktails are rather endearing. All of us flipped for the crisp fried okra first time out. Tonight we’ll have them with cocktails. So here we are again just two weeks ago. 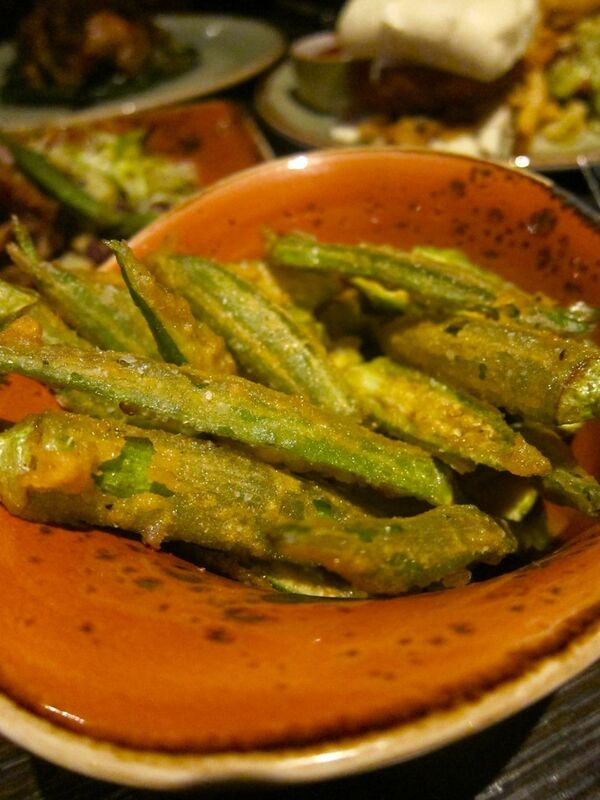 I suggest we get a side of the crispy fried okra to munch with the drinks (which take a while to appear). The okra isn’t as thrillingly crunchy as on my first visit but, even so, the ooze that makes so many of us hate okra is totally conquered. My friends, first time here, are grooving already. A large portrait nearly covers one wall of the dining room; underneath, figures on wallpaper. The truth is, we love being in a room with blacks and whites eating together – at the next table, at the same table. It’s New York. I’m not sure why you only find that mix uptown these days, but never mind, we’re here. Not all longtime residents of Harlem are cool with the latest Renaissance – it may be too white and too pricey for them – but so far it’s not too white for us. 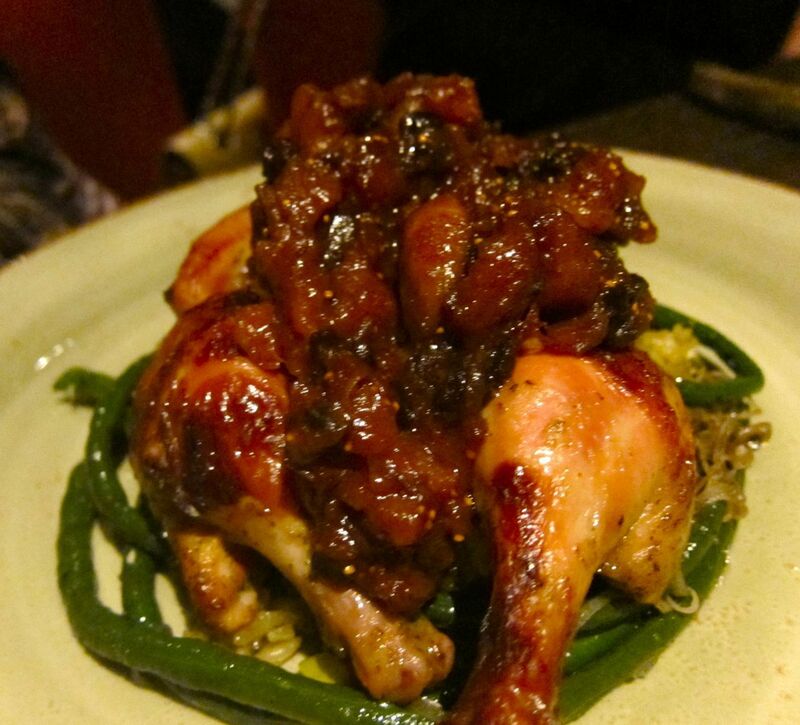 Poussin yassa is a small, juicy bird with bourbon dried fruit and sweet coconut sticky rice. 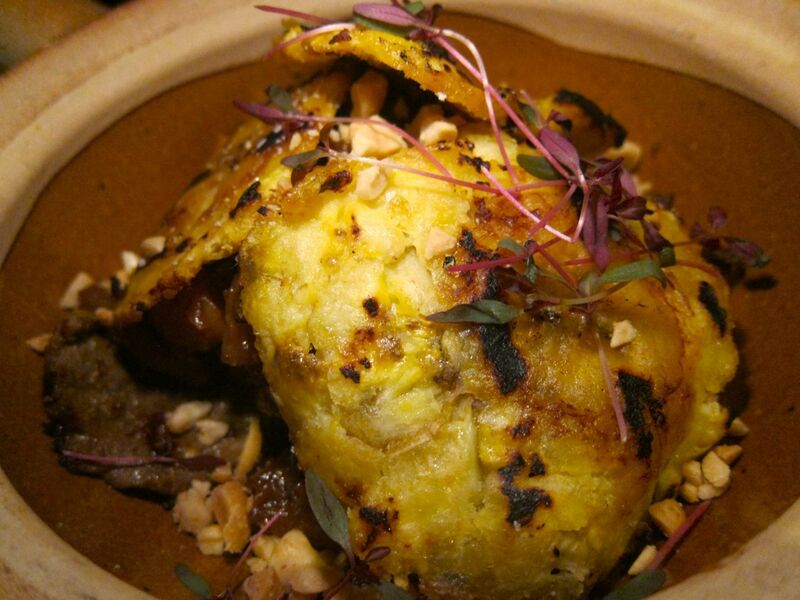 When the oxtail dumplings flying a taro chip banner and the poussin with curry coconut sticky rice and bourbon dried fruit are this luscious, we consider ourselves more than rewarded. Two broiled giant prawns on a yam flapjack in a kicky piri piri sauce as a starter are probably not meant to be shared by four, though we try. I make up for that with the sensational chili scallion house-cut fries. I only mean to eat six, but in the middle of it all, I forget. Grilled plantains and rum-soaked apricots add romance to West African beef suya. My friends can’t seem to suppress whatever it is that makes you want to order a beet salad on 118th Street when you could try the “West African Beef Suya” with rum-soaked apricots and grilled plantains. All of us liked it on an early first visit, I tell them, pushing a little. But we skip both beets and rummy apricots this time. 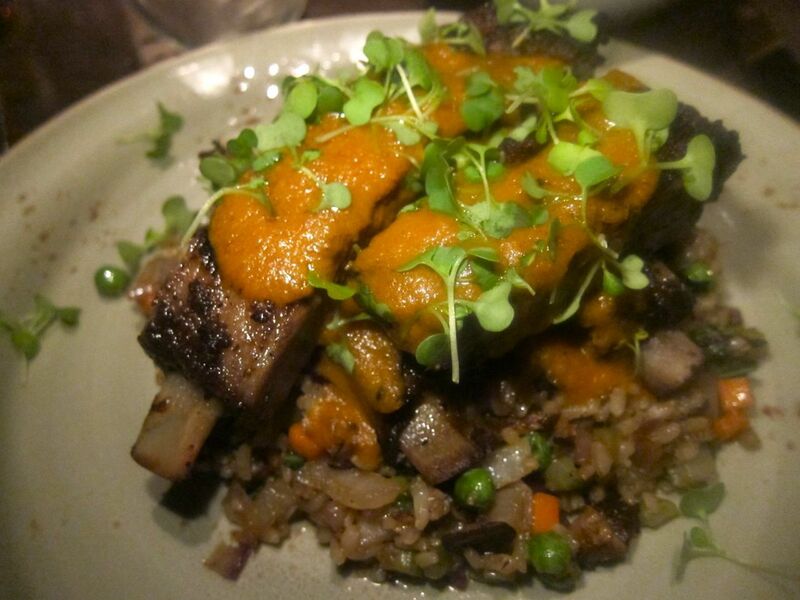 Crispy smoked ribs topped with a torrid piri piri sauce ride atop vegetable-studded brown rice. On another visit I had discovered the “Rice and Vegetable Wok Bar” section on the menu ($18 to $25 a bowl). You pick one rice (black, jasmine or sweet brown), say how you want it cooked, choose a flourish (chili tofu, wok prawns, smoked chicken breast, ribs) and select a sauce. I try that for my starter tonight. The smoked country pork ribs were fresher and chewier and the piri piri sauce was more torrid on that first tasting, though still good enough now on the second. The fried brown rice with veggies is delicious. 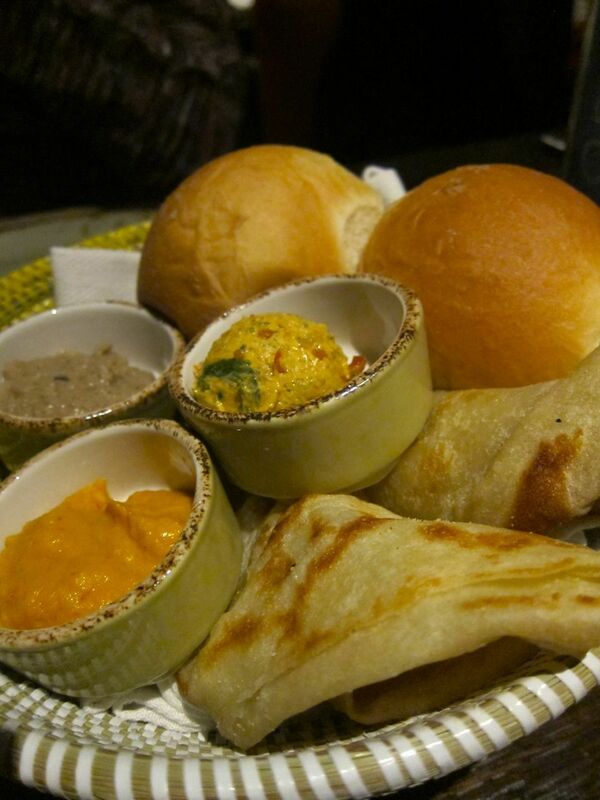 I didn’t think this basket of roti and rolls with some sauces was worth $8 extra. Perhaps the citrus jerk wild bass is nothing much, but my friends are not really listening to me when I point out my favorites. My friend Blanche is perfectly delighted with her black benne seed ahi tuna with bok choy, Chinese sausage and curry crunch (how’s that for a global run-around?). 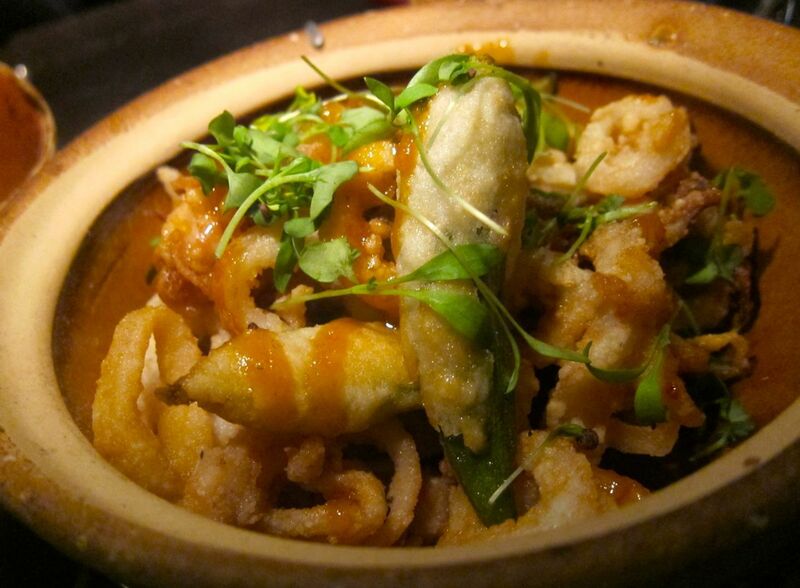 Spicy and crispy battered squid is tossed with okra and sweet peanut chili sauce. I suspect we’d all be happier sharing the fried guinea hen heady with cinnamon (“It’s our version of fried chicken,” Smalls had noted). On our first visit we loved the unusual Gullah shrimp burger with house-made kimchi on Chinese white bread, too. Nothing we’d ever see downtown. 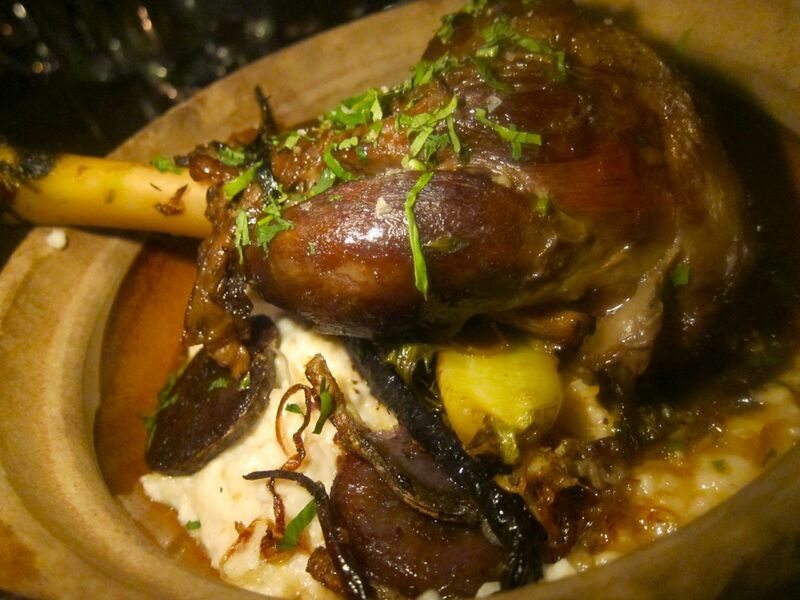 After so many starters, the braised lamb shank with coconut grits looks especially daunting. Peter is high on his braised lamb shank -- is it lamb or dinosaur? -- on a marsh of grits. I find it a bit dry. Nothing will do for me except macaroni and cheese (the outsize smaller $14 option) that comes with a shovel to spoon it up. It is crisp and browned –with ham or without -- richer than my mom’s. I might be tempted to eat it all, but my three companions are shoveling it down too. That may be how I lived to tell the tale. It’s our favorite dish of the night. 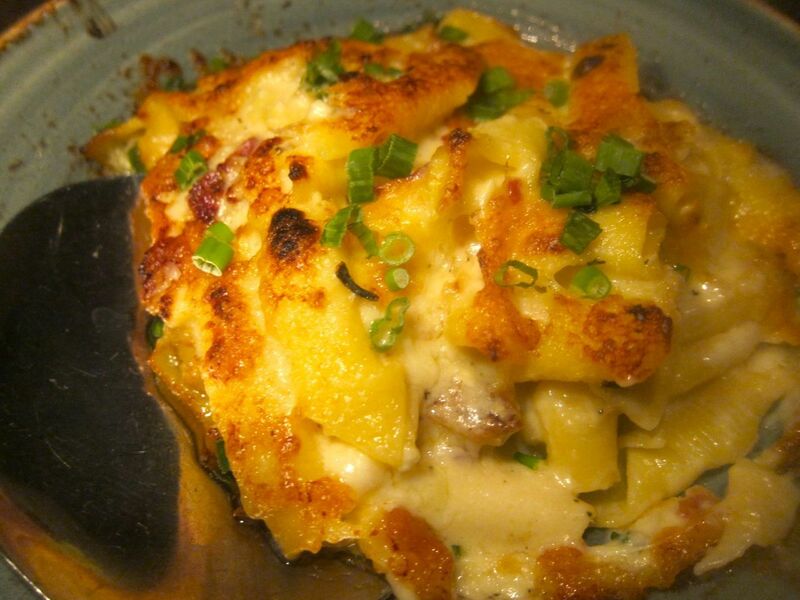 Even the small macaroni -- crustier than remembered but just as luscious – is too much for four. Parsons had talked of opening a spot in Harlem for years. He and Smalls, originally an opera star, later proprietor of Café Beulah and a caterer, searched for a space together. While working on the heritage project – turning the famed jazz club, Minton’s Playhouse, into Minton’s, a spiffy upscale supper club -- they launched The Cecil next door under a bright green neon sign. 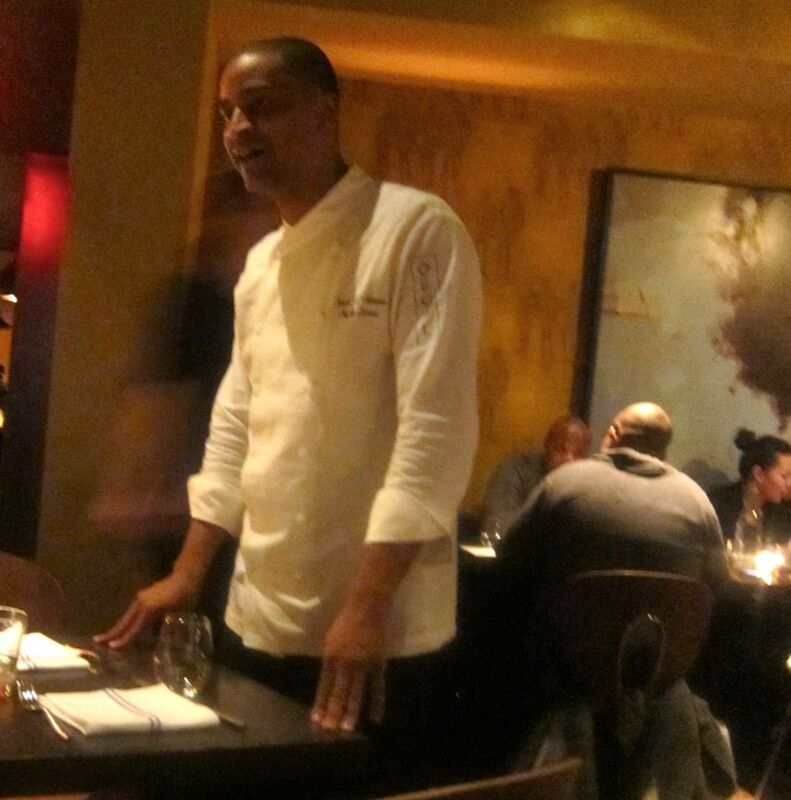 Chef de cuisine J.J. Johnson comes out of the kitchen to make sure partner Alexander Smalls is happy. The bar with its somewhat Klimtesque lovers above has been crowded from day one, and the sprawling space beyond with sheer curtains on big streetside windows, bare tables, a big painted mural and rows of hanging lights, mixes locals with downtown strivers like us in every shade of the City. It’s noisy, but not killingly loud, unless someone turns up the music at about 10. That’s Smalls himself dining with friends at the next table, interrupting to make the rounds. 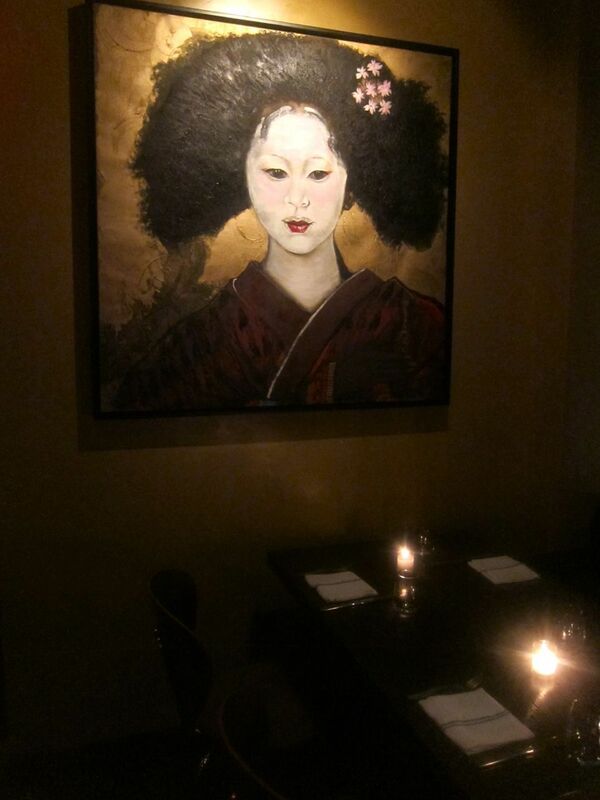 New since my last visit is the charming portrait at the back of a bustling room, turning tables. Entrées are $19 to $36 but if you’re thirsty, as my friends are tonight -- sampling not just The Blood & Fire, but also the Masai and a Sesame Highball -- dinner might run $85 per person, all included. None of us can handle dessert after all. But having already tried the too-tiny whiskey sticky bun with candied kumquats and bourbon toffee sauce, and a date-apricot cake, I don’t insist. 210 West 118th Street (on the NW corner of St. Nicholas) 212 866 1262. Dinner Monday through Thursday 5 pm till midnight. Friday 5 pm till 1 am. Saturday brunch from 11 am. DJs 2 to 6 pm. Dinner till 1 am. Sunday 11 am to 10 pm.